Assassin’s Fate (2017. 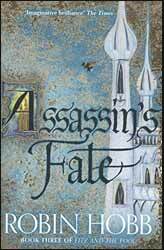 853 pages) is the third and final book in Robin Hobb’s The Fitz and the Fool Trilogy. Time will tell if this is a fitting end to a story which started twenty years ago and has been spread across three trilogies.